A while back her Majesty, Patricia, asked Fearghus to be her Queen’s Champion. 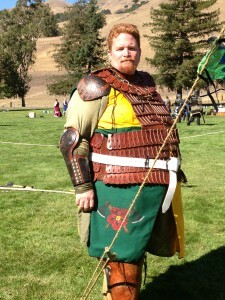 For this position Fearghus asked me to make him a tabard and to help paint his war shield. He wanted both of these marked with a personal symbol for the Queen’s Champion. That is, he is not the Queen so I advised that he could not rightly wear the arms of the Queen and at this time (AFAIK) there is no “official” symbol for the Queen’s Champion. 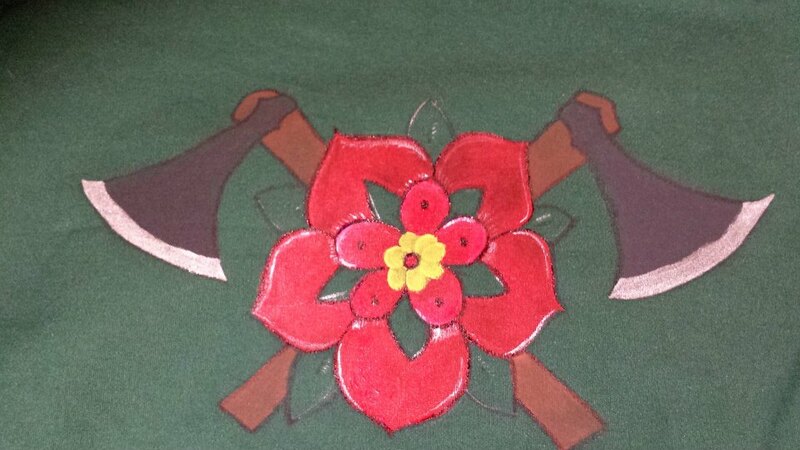 After discussing this with Fearghus and Their Majesties we decided to use a pair of crossed axes behind a Tudor rose and to arrange these items on the green portion of a quarterly green and gold field. The axes are modeled after the Ax Fearghus received at his knighting named “Blue’s Song”. The Tudor rose is modeled after a Tudor Rose that Her Majesty has tattooed on her forearm. 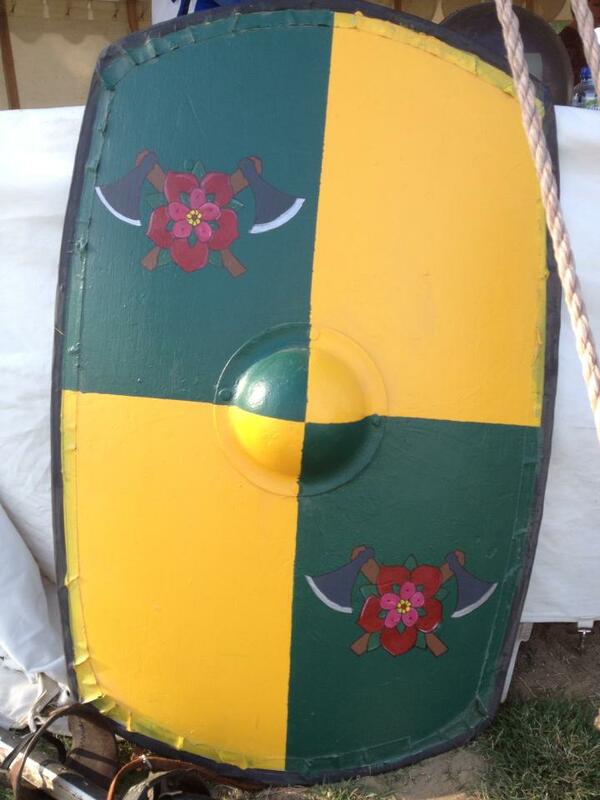 I painted these on the fabric and the shield using artist’s acrylic paints. 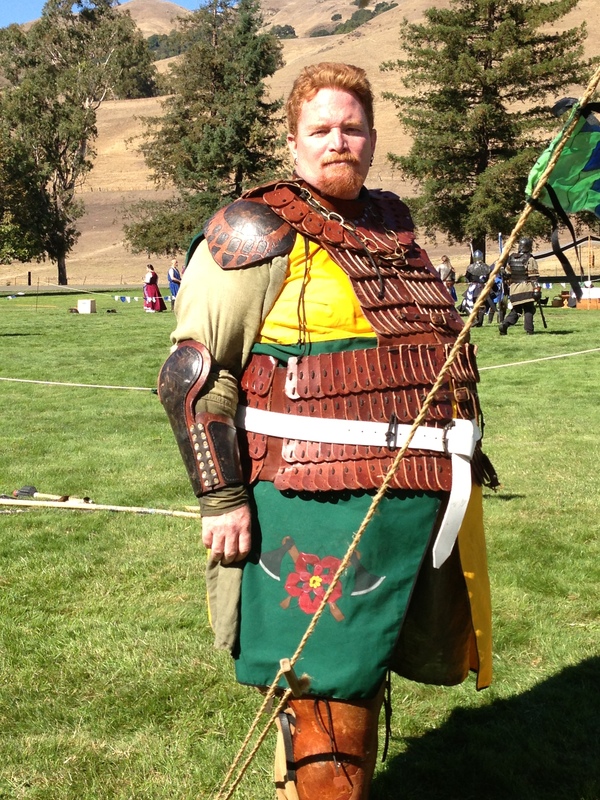 Yes, I’m aware that the quarterly between the shield and the tabard don’t match. This unhappy accident brought to you by having one person sew a tabard while the other person paints the quarters on a shield. By the time we noticed there wasn’t enough time to re-do either before they’d be used.